I love a good ghost story. I am completely intrigued with any supposed haunting and always have been. Dan is the same way. The one show we watch together is Ghost Hunters. We love researching local tales of haunted places, learning the history to it. I think that is what attracts me the most, the history of these haunted places and what all has happened there to start the ghostly tales. 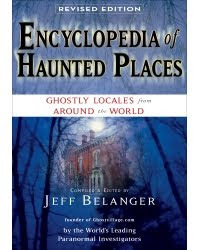 So, I was very excited when I was given the chance to review Encyclopedia of Haunted Places: Revised Edition compiled & edited by Jeff Belanger. This book takes you all around the world to a lot of different supposedly haunted locations. It is full of tales of hauntings, the accounts by some of the leading paranormal investigators the world over. I found haunted places close to home I'd never even heard of before, so I was delighted. The accounts of the hauntings are both thrilling and informative. There is also quite a bit of information on paranormal investigators from all over the world, which I found very fascinating. I found this book to be informative and entertaining. Thanks to Jeff Belanger, there are several places we are now very anxious to visit. It is an easy to read book and it is easy to navigate. I had no trouble finding exactly the information I was looking for. If you are interested in the paranormal, you might enjoy this one. The book is available at Barnes & Noble, Borders, Amazon.com, and many other booksellers. Jeff Belanger has been studying and writing about the supernatural for regional and national publications since 1997. He’s the founder of Ghostvillage.com, the largest supernatural community on the Web, and the author of more than 10 books, including The World’s Most Haunted Places, Our Haunted Lives, and The Ghost Files. Belanger lectures throughout the United States and has appeared on more than 100 radio and television programs worldwide, including The History Channel, The Travel Channel, Living TV (UK), The Maury Show, The CBS News Early Show, National Public Radio, The BBC, Australian Radio Network, Coast to Coast AM, and The ‘X’ Zone. He currently haunts Massachusetts with his family. I have one copy of Encyclopedia of Haunted Places: Revised Edition to giveaway. To enter, simply leave me a comment telling me about a ghost story from your area. I look forward to reading your comments. Please note that comments such as "I want to win" or "please enter me" will not be considered. Deadline to enter is 11:59pm CST on Halloween 10/31/09. Good luck! I would absolutely LOVE to have this book! I am fascinated by hauntings. Some people think I am strange but I read just about anything I can get my hands on regarding hauntings! One story I have heard about my area is actually on my neighbors property. There is supposedly an indian burial ground on the hill behind our house very close to where some friends of ours live. Many years ago a water tower was built on the site and my neighbor swears that at night you can hear very strange noises coming from that area and glowing lights. I haven't heard them or seen the lights but I am chicken too go up there! I love to anything to do with a Hunted House! In fact~I do believe that my own house is haunted as we will hear voices and the doors and windows and no one is there! I am not scared but I sure would like to know who it is.. I don't know any ghost stories from around my area, but I believe there's paranormal activity in my apartment. There are sounds and winds in the apartment that can't be explained. A few times things have moved. The refrigerator actually moved, and there were two of us who saw it. Once a glass moved from one side of the table to the other. It's rather playful. I'm not afraid. I'd love to read this book. The paranormal fascinates me. There's a local ghost story of the "Levee Walker". If you go to the levee and stand there at the right time, the Levee Walker will come after you and you are to never be seen again. Bobby Mackey's bar is on a winding road by the Licking River. It's been registered as a haunted place for decades. Not sure if it's true or alcohol related hallucinations but that's northern kentucky's claim to haunted fame. We have supposedly very haunted place near us, Eastern State Penatentiary. It is really erie there but I have yet to see a ghost. I've never been there but they say that at Durand-Eastman Park the White Lady haunts the park. Over one hundred years ago, a woman who lived in the area now covered by the park, lost her daughter, theoretically to a wayward man. She never was able to find her daughter, and now roams the park, searching for her, as well as other girls in potential danger. Visitors to the beach for the past hundred years have claimed to see her. My ghost story is kind of sad but most definitely true. Back in 2005 I used to live in The Netherlands and I knew two little boys around the age of 6. And they just learned how to swim and push them selves off the bottom. So where we lived was a pond with an open dock. This is what we think what happened, they figured they would push themselves up from the bottom after jumping in but both of them never came up again. So the day it happened I was relaxing in my room when all of a sudden I heard voices (my dad is a medium) and they were telling me to tell their parents they we're alright, which I did and they were relieved. Sad but very true story. The last hurricane to hit the Tampa Bay area was over 80 years ago. Back then they didn't have the ability to predict them, and so people couldn't really prepare. The paper recounted the story of a couple that were out for a picnic when the storm hit. They clung to a tree and while he held on she went missing. People out on the beaches say they can see her ghost, and that she is protecting the area from any more storms. We have a story that's been around for a while about a ghost at the middle school. A maintenance worker fell to his death back in 1920's or so, and now haunts the upper floor of the school. It is said you can hear him fixing things, like hammering,moving chairs and closing windows. There was an old cemetary down the street from where from where I grew up. There was a grave with a young girl buried there. It wasn't a plain headstone. It had a life size statue of an angel. The stories goes that there are nights when the statue would glow. The kids in the neighborhood used to call it the shining grave. Not far from where we live is an elementry school that is haunted. At midnight, the ghost of a little girl runs down the hallway, screaming,with a man chasing her. I have heard this from several people. I would just love to have this book. Ive always been facinated by the idea of ghosts and the paranormal. My grandmother's house is believed to be haunted. I had a family member who was killed in that house years ago. I lived there for a while and Ive heard noises, radios and fans being turned off and on. I once heard a woman crying. My sister was there one night alone with her children and she called me histerical to pick her up cause the pictures flew off the wall. The ghost of Resurrection Mary hitchhikes along a road nearby, and when motorist pick her up she disappears from the car right when driving by the cemetery. This has been going on for years. I live down the road from Gudgeonville Bridge (well, I did, someone burned it down.) It's supposedly haunted by the spirit of a man & his donkey. It's said that if you listen on a quiet night, you can hear the donkey clip-clapping across the bridge. We have a area out here that is called Vampire Valley. It is a really secluded creepy area off of a gravel road. There is a bridge that goes over a creek. Its not very high up, maybe 15 feet. The story goes that a farmer got mad at his cheating wife and hung the whole family over the bridge and then hung himself. I have never seen anything there myself, but it is still super creepy. I don't know about any local ghost stories, but I went on one of the ghost tours in Savannah. It was really creepy and fun. There is a elementry school where I live that is haunted with a headless horseman. Resurrection Mary is a tale from the Chicago area. Their is one haunted house in our downtown area their was a murder their like in the 1880's. He killed his whole family and sometimes people say they see him and their have been accidents of the workers of the haunted house. They open it up as a haunted house every year. It's now a school but half the place is abandoned. Me and friends have been there countless times. . . You can literally feel the dread in the air since they abused their patients back when it was an old mental institution. I love reading about paranormal activities. There is a stretch of railroad in our area that is supposed to be haunted. The story has it that a teenager was ran over on the track and was decapitated. Supposedly, he walks the tracks at night with a lantern looking for his head. Thanks! Their is a haunted old psych hospital in Phila,but I don't know if it is or not it freaks me out!! Most old hospitals are haunted. There is an empty field near where my daughter lives that was the site of a mob hanging during the Civil War, and people (her included) swear that some windy nights you can hear the horses running and the people muttering under the huge old oak tree. The Oakwood Inn in Raleigh was built in 1871. Their resident ghost is called The Colonel, since he is dressed in a Civil War uniform. If the owner closes the door to one particular cabinet and leaves the room, the doors will be WIDE open when she comes back. She's also seen a candy dish float in the air, and one guest reported that the Colonel sat on the side of the sinke while she was taking a bath! I would like to give this book to my mom she would love it!! Our local ghost story is about the "Dover Lights" the legend is that the ghost of Civil War soldiers still roam in the canyon from a battle once fought there and if you go on a cold crisp winter night you will see the souls still marching thru the valley as little balls of light. The Bermuda Inn was originally owned by the Mesereaus. In 1860, Mr. Mesereau went off to fight in the Civil War and left his wife Martha behind. She kept watch at the window, waiting for his return but he never came back. She used to leave a candle in her window so he could find his way home. Supposedly, when Martha heard that he had been killed in the war, she took to her room and died of a broken heart. People have reported seeing her ghost at the window, and construction workers frequently hear strange noises and see locked doors opening on their own. One day, a portrait of Martha mysteriously went on fire. Cameras in her room do not work, but upon entering the hallways, the cameras work again! The Biltmore Hotel was used as a VA hospital back during WWII. There are lots of stories of creepy things. I was in there once and it was kind of spooky. I live near Virginia City, where there have been tv show documentaries mentioning the hauntings there. My apartment I live in is haunted. We have had curtains open up by themselves. We have had doors open up by themselves and have seen a little girl among other shadow people. One of my siblings seen a little girl looking out one of our windows. There is an abandoned insane asylum a few miles away from me that is supposed to be haunted. People claim to hear a lot of screaming and a lot of people have seen a person in a straight jacket it one of the windows. Thanks for the great giveaway I love the paranormal! Although I am a chicken about going to haunted places (I'm afraid of spirits following me home!) I love reading and watching shows about them. Chatham Manor is part of Fredericksburg & Spotsylvania National Military Park.Over the years many visitors and residents of Chatham have seen a girl, now know as the Lady in White. She appears as a spectral figure and glows an un-earthy white wearing a long colonial style dress.Once every seven years between 12 pm and 12 am the lady in white walks the path, known as the ghost walk, which leads down to the river where her lover was supposed to meet her.